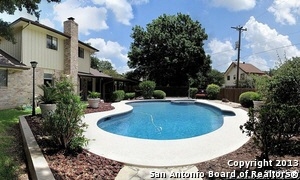 Description: Beautiful poolside living can be yours! 25x9 covered patio & 15x18 deck perfect for outside enjoyment! Pretty kitchen w/tile counters, black appliances, glass cabinets & wet bar! Downstairs master retreat! Wood parquet floors in family room & entry! 2 living areas & 2 dining! Tile floors in kitchen, breakfast, utility & baths! Tons of storage plus 24x16 garage! Pretty brick fireplace w/gas starter! Huge rooms! Recent roof & pool updates! 1 owner quality built & lovingly cared for! Great price....Hurry!